Candy Bars, Candy Bags, Chip Bags, Small Savory Snack Bags Arranged In A Foam And Candy Box Base. 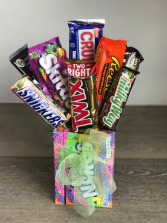 Our candy bouquets are a fun way to celebrate, especially for those who want something that lasts (or at least lasts until the last bite!). 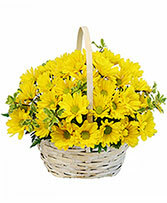 We can do sweet, savory or a mix! Please note any food allergies or special requests when ordering in the notes. 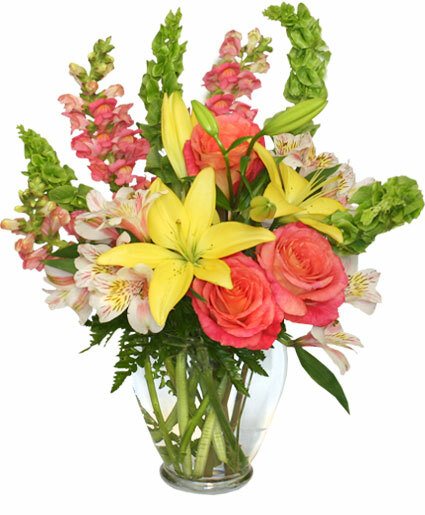 For a truly customized bouquet, call us at 765-529-6303 to order. 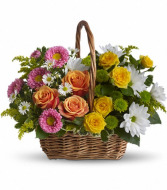 Matsumoto Asters, Spray Monte Casino Asters, Spray Roses, Standard Roses, Button Poms, Greenery.